Ha Giang is a unique place, that is untouched by mass tourism. The Chinese invasion of 1979 has been forgotten and the Vietnamese Government has financially helped with the construction of the new roads and infrastructure, and there are also some modest hotels. In Ha Giang town you will find any hotels and accommodation as well as homestay. If you continue to Dong Van and Meo Vac, accommodation deals are shrinking. The attendance of Vietnamese tourists gradually increasing, but also some foreign tourists are coming here. Authenticity, nature, beautiful mountains and no comedy for tourists. Ethnic woman goes with a pig on the market in Dong Van. You will see a lot of fantastic mountain sceneries at the entire area. Starting with hills, valleys and villages with the ethnic minorities residents (Hmong, Tay, Dao, Nung, Lo Lo, Giay, Pu Peo). The farthest and the most beautiful place of Ha Giang province is Dong Van Karst Global Geopark, designated by UNESCO as one of 77 sites with the important geological and cultural heritage. This geopark is littered with the ethereal karst formations that are nearly 400 million years old, and has two protected areas. Dong Van Karst Global Geopark is a home of 17 ethnic minority groups. Ethnic minorities creates a unique and rich cultural heritage of the area. Traditional practices and habits of these ethnic groups are very diverse and interesting and they attract many travellers to explore these unique aspects. Northern most place of Vietnam is the village Lung Cu with the Vietnamese flag on the Dragon mountain. Lung Cu is known for many special foods and beverages. You can taste the alcohol from honey and corn, or Thang Co soup, which is cooked from every part of the animal. Take a motorbike and drive through the fantastic areas of Meo Vac. You can go to Meo Vac town from the Dong Van town , through the mountainous area with altitude of 1500 meters. This area is one of the most beautiful that you can see in the Ha Giang province. If you manage a time to visit this city on Sunday, you can go to the Sunday Market, which takes place outside the city. People from surrounding come here to sell their things, animals or food. There are plenty of ethnic markets in Ha Giang province, almost in each town. One of the most interesting is Khau Vai „Love market“ 20 km from the city center, see map. People from the ethnic minority Hmong, Tay and Lo Lo are coming here and seeking a life partner or they are changing the partner. This market is held only once a year 27th day third month of the lunar calendar. Watch the video from the „Love Market„. 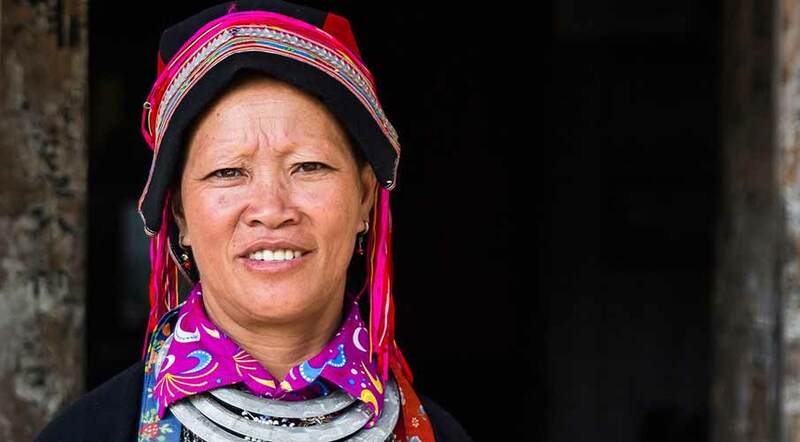 Woman from the Dao ethnic group. Visit Meo Vac market with ethnic residents every Sunday morning. Meo Vac town in the province of Ha Giang is an ideal place to visit the Sunday market, where ethnic residents sell mostly an cattle. They sell also dogs, goats, pigs. This market is not just a selling point, but also in terms of maintaining social relations of ethnic people. Ethnic residents (Mong, Tay) from distant areas around the town of Meo Vac will meet there. Some people go on foot at night with cattle for example 20 km. Market starts every Sunday since morning, most busy from 7-10 am and on the place you can taste local food and corn and rice alcohol. You have to buy a permit to the remote areas in Ha Giang province. This permit costs 10 USD and can be obtained at the Immigration Office in Ha Giang town or at the police station in Meo Vac. Near the town of Ha Giang, 7 km south you can visit the Phuon Thien cave. It is a place of many monuments and many plums, pears, oranges and apple trees grows here. If you go from Hanoi, the best way is to take the train to Lao Cai and then a bus from this city. The bus trip from Lao Cai to Ha Giang town may take up to 6 hours. Yes sure, the best way how to get there is with a motorcycle. The Hmong king’s palace (Vuong Chinh Sinh) in Sa Phin village. On your way to the farest places of northern Vietnam – Dong Van and Meo Vac, visit the The Hmong king´s palace in Sa Phin. This unassuming palace is located along the road to Dong Van. However, it is very important for the local Hmong community. Residents of this area during the reign of Vương Chinh Đức together with Ho Chi Minh and gained national freedom. The palace has been used as a residence and fortress during Vuong Dynasty. You can also learn something about the history of Ha Giang province. Try to allocate more than 3 days to explore the province of Ha Giang. Noong lake – near to the Ha Giang town. The lake with growing trees in the water. If you stay for a while in Ha Giang town, you can visit a large freshwater Noong lake. The lake is 25 kilometers south of the city, in monsoon period may be 80 hectares large. Fascinating insight arises in the dry season, when the water depth decreases, in the lake are growing trees. Local fishermen from Ha Giang are catching fish and shrimp in the lake, and you can ask them for sailboat on the lake. It is no problem to go there with a motorbike. Ma Pi Leng Pass – The Pass, which goes through the high mountains area. After a few minutes drive from the city of Dong Van begins famous road and mountain pass – Ma Pi Leng Pass. It’s probably one of the most beautiful roads you can ride in Vietnam. History of the road falls to the period between 1959-1965, when thousands of young people from 17 ethnic groups built this way, the construction process took 11 months. Initially, the road was only for walking or horse team, but later it was extended to cars and trucks. Hills and mountains creates here fantastic images and the roads are dangerous here, ride cautiously on a motorcycle . Hoang Su Phi is a remote area in Ha Giang with beautiful rice terraces. Hoang Su Phi is less frequented area by tourists in the province of Ha Giang. But that does not mean it is not pretty. The entire area will pass huge areas of rice terraces, unspoilt nature and ethnic villages. If you stay for a few days in Ha Giang, this place is definitely worth a visit, but you need to take at least two days. Hoang Su Phi is about 70 km from the city (see map), but to get there through the winding road takes a lot of time. Hoang Su Phi – untouched nature, ethnic villages and cultural heritage. There are about 3 cheap hotels (Nha Nghi) in Hoang Su Phi town, or you can use a homestay with local people, ask the people at the city. There is also Panhou village ecolodge on the way, with higher prices for tourists. Ethnic residents are composed of 11 ethnic groups (mainly Hmong, Tay, Dao and Nung). Hoang Su Phi lies at an altitude of about 1000m, the weather is about the same as in Sapa, this place is with a little bit limited services. If you travel to farest distant places (and most beautiful – Dong Van, Meo Vac, Lung Cu …) in the province of Ha Giang, you will have to buy a permit. This permit can be purchased at the immigration office in Ha Giang town. This office is located on the street Tran Phu, 415a in the northern part of the town (see map below this article). Obtaining is very simple. The officer at the window, handing his passport, he fills in the data from the passport to permit and you pay 10 USD. Then he will give you a permit and passport back. If you arrive on a motorcycle, police officer want a registration number of motorcycle, he writes this number to permit. Permit can also be purchased at the police station in Meo Vac town.